Due to very popular demand I have finally written down my tutorial to my very simple newborn baby booties! hoorah! 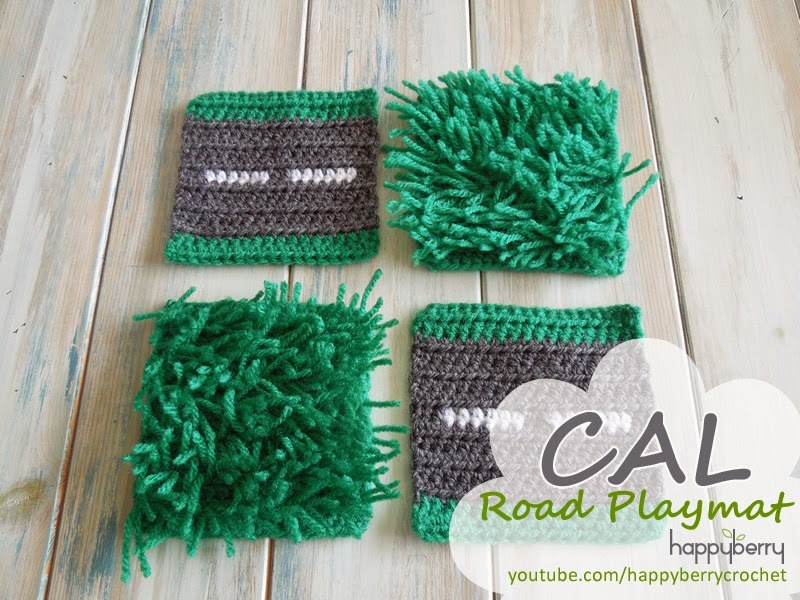 You can watch my video tutorial at the bottom of this written pattern on how to make them as well as my video tutorial on how to make the matching newborn beanie. These booties are very quick to work up and look great in 3 colours but you can of course just keep them plain in one colour. Have fun! Simple and Quick Newborn Baby Booties! Crocheting back into your foundation chain sts, work 2sc in 1st st, 1sc in next 12 sts, 2sc in last st - (32 sts in total from steps 1 and 2) sl st in next st regardless of round. Continuing in W ch1, 1sc in next 13 sts, hdc2tog, dc2tog twice, hdc2tog, 1sc in last 11 sts, sl st in ch1 - (29) Fasten off and tie in all tails. © HappyBerry This pattern can not be reproduced in any way without credit given to HappyBerry. This includes copying and pasting into another blog or website, and filming the pattern for use on YouTube. You can however print it off for personal use or for use in a crochet group. Thank you. 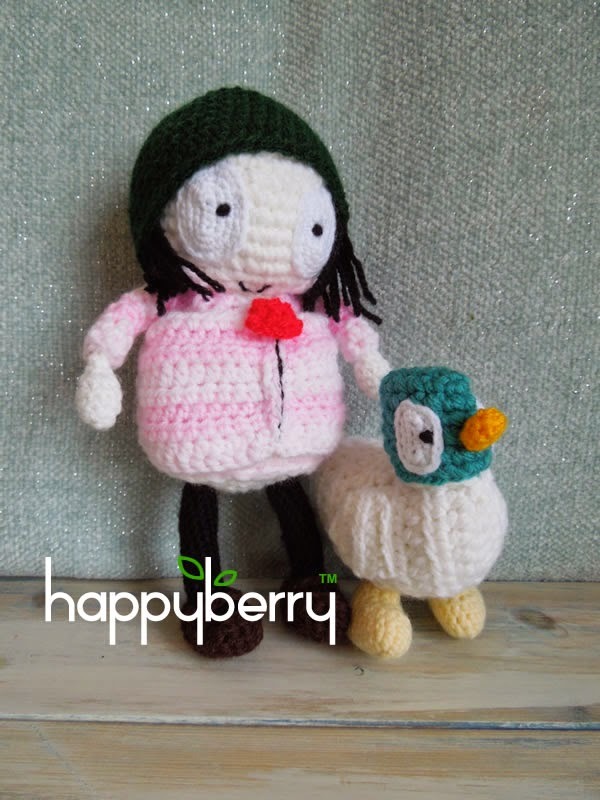 This is probably more well known to us Brits but there is no reason why all crocheters cannot enjoy these adorable characters from a well-known British children's TV show called Sarah and Duck. I decided to make these characters because the show is still fairly new and cuddly toy versions don't exist. With a 3 year old totally addicted to the sweet cartoon it only made sense to get my crochet designer hat on (it's crocheted of course) to put together a design for Sarah and Duck! I think they came out fairly well so I thought I would share the pattern with you guys so here is the crochet pattern for everyone to enjoy making them! I do not recommend selling the finished items though due to BBC/Karrot Entertainment copyright laws! You have been warned (^-^). Some of the yarn is doubled up but the pattern will state to use two strands instead of one. If the pattern doesn't say to use two strands, just use one as normal. If you prefer you can use a chunky/bulky yarn instead of doubling up the yarn when required. 1sc in ea st around - (12) Remember! Don't join rounds unless it says to do so. 1sc in ea st around - (14) Fasten off and tie in tails. Ch1, turn, hdc2tog twice - (2) Ch1 and fasten off, tie in all tails and repeat for other side. *1sc in next st, 2sc in next st, 1sc in next 3 sts, 2sc in next st* repeat from * to * once more - (16) Fasten off leaving enough yarn to sew onto head. Take 2 short lengths of B and tie 3 knots into each length in the middle. Sew each end onto the white of the eye and tie on the back. Repeat for other eye and sew finished eyes onto the head either side. 1sc in ea st around - (6) Fasten off and sew onto head at the front. Ch1, turn, sk2, ss in next st, 1sc in next st, hdc2tog - (3) Ch1 and fasten off leaving enough yarn to sew onto sides of body. Repeat for second wing and sew wings onto body pieces. Now take your body pieces and place them together, one on top of each other with the beginning straight edges together and the pointy tails ends together, so they match. Take your finished head and using C, sew each side of the head onto each side of the body pieces, at the front straight edge ends, starting at the back of the head and sewing round to the front of the duck and then along the other side, to the back of the head again. Tip* Do not sew by looping yarn over the joining edges, instead sew along body edge and then into head edge, then sew along head edge and back down to body edge. This hides the seam better. Before continuing sewing, stuff your head at this point. Now sew along the duck's back, joining each body side as you go, under his bottom and to the front of your duck, leaving a small hole for stuffing the body. Do not fasten off. 1sc in ea st around - (12) Fasten off leaving enough yarn to sew onto body. Repeat for other foot and stuff your feet. Sew onto sides/bottom of body pieces either side, hiding your yarn ends on the inside of your duck. 2sc in ea st around - (12) Remember! Don't join rounds unless it says to do so. || PAUSE your work here and start on other parts. *1sc in next 3 sts, 2sc in next st, 1sc in next 5 sts, 2sc in next st* repeat from * to * once more - (24) Fasten off leaving enough yarn to sew onto head. Take 2 short lengths of B and tie 3 knots into each length in the middle. Sew each end onto the white of the eye and tie on the back. Repeat for other eye and sew finished eyes onto the head. Using LP and a 3mm crochet hook, crochet 6sc into a magic circle, pull to tighten, sl st to join - (6) Fasten off and use remaining yarn to sew onto head. Using B sew on a small mouth, hiding ends inside your head. Stuff your head at this point. Do not fasten off but continue to make the body using the same doubled up yarn and hook. Join LP, 1sc in ea st around - (36) Fasten off LP and C and tie in all tails. *1sc in next 4 sts, 2sc in next st* repeat from * to * until end - (36) Fasten off and tie in all tails. Stuff the feet at this point. 1sc in ea st around - (10) Fasten off on last round. Stuff legs at this point and use remaining yarn to sew legs onto body base. Repeat for other leg. Stuff hands only at this point, do not stuff arms. Now sew arms onto main body at the side but at the very top by the neckline. Stuff your body and sew body base onto main body. Taking a few strands of B, long enough to reach either side of the head, tie them together in the middle and sew into place on the top centre of the head so they now hang down either side in place. You will not see the hair on the top of the head because of the hat so don't worry about it looking a bit bald! You just need to emphasise the hair under the hat by the neck. 1sc in ea st around - (40) Fasten off and tie in all tails. Using the beginning tail end piece of yarn, sew up outside of the hat and form a small loop, sew back down and fix into place. This creates a small loop for her hat like on a beret. Use remaining yarn to sew hat into place, making sure to style the hair as you go so it pops out from under the hat at the sides. Also make sure to position the hat slightly to the back of the head rather than on the top directly. Ch1, turn, hdc2tog twice, 1hdc in next 2 sts, hdc2tog twice - (6) Ch1 and fasten off, tie in all tails. Ch1, turn, hdc3tog - (1) Ch1 and fasten off, tie in all tails. Sew your coat pieces together, making sure seams are on the inside. Pull sleeves over arms, this can be difficult but do persevere! Put on Sarah's coat and sew the arms onto the main coat, sewing her into her coat. Repeat step 6, fasten off on last round leaving enough yarn to sew hood onto main coat. Sew hood to main coat. Fasten off and tie in all tails. Ch1, turn, hdc2tog - (1) Ch1 and fasten off using remaining yarn to sew onto coat. Sew on zip to main coat. Using B sew some sts up the front seam of your main coat for a zip effect. 1sc in next 5 sts, ch2, sk5, 1sc in last 2 sts - (9) Fasten off and tie in all tails. Fit your shoe onto Sarah's foot, it is tight but this keeps the shoe on securely. Repeat for other shoe. I hope you enjoyed this tutorial. 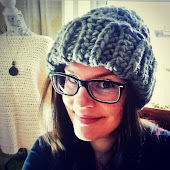 For more crochet pattern fun then please pop by my website here: http://www.happyberry.co.uk or join me on YouTube at http://www.youtube.com/user/happyberrycrochet or even come say hi on Facebook here http://www.facebook.com/happyberrycrochet. I'd love to see you!